Product information "K2 C9038/C9039 End Cap Replacement Kit"
Secures slipped conservatory roofing panels finished with genuine K2 end caps! 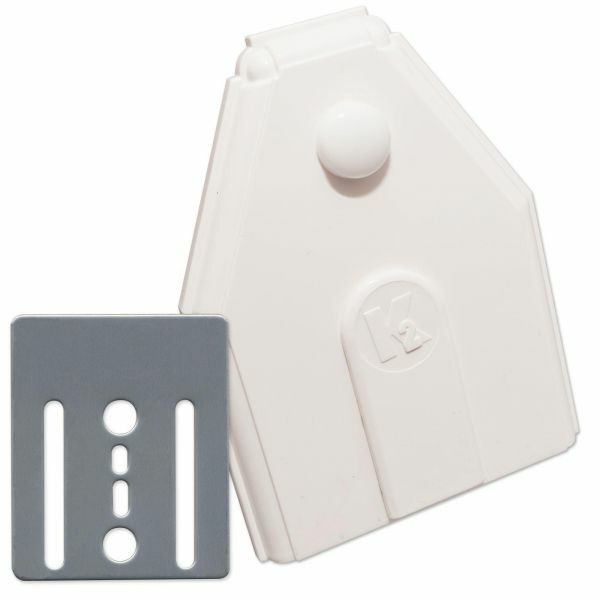 This end cap replacement kit includes a glazing bar end cap (C9038), also known as transom end caps, or rafter bar end caps and a Glass Plate Retainer. They are manufactured by K2 for the K2 conservatory roofing system. The K2 C9038 is a decorative, sculptured end cap, which can be used for new installations, as well as in the replacement of broken or missing consrvatory end caps. End Caps are found at the end of the the roof glazing bars that support polycarbonate roof sheets or glass units. Traditionally used to close-off and offer a decorative finish to the open-end of glazing bars, end caps are sometimes also relied on to prevent roof panels from slipping. However, under constant pressure from the weight and movement of the roofing material, an end cap alone is not adequate. That's why we supply Roof Glazing Retainers to do the heavy work behind the end cap. It's really easy to fit these end caps and everything you require, such as screws, glass plate, cover plate and screw cap is included. Aligning the glassplate to the inside of the end cap before screwing onto the roof spar will make things easier. Then align the end cap to the roof spar and screw into place using the screws provided. Related links to "K2 C9038/C9039 End Cap Replacement Kit"
Customer review for "K2 C9038/C9039 End Cap Replacement Kit"